Every month I post about my clothing budget. My budget per month is $350, which may seem like a lot to some and a little to others, but feels just right for me. You can read my thoughts on my 2017 budget here. 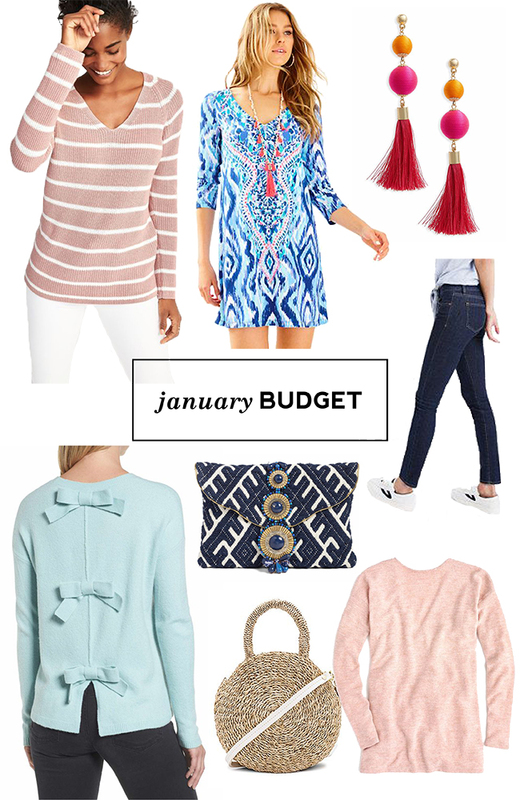 We're here, the first budget post of the year! Are you excited? Let's dive in. Old Navy Striped Sweater - originally $34.99, on sale $27.99. I love, love, love this sweater. It is so freaking cute and cozy. I just wish I had cooled my boots a little - I was really worried it would sell out, and so I bought a regular large. I really could have used that tall! So that's something to keep in mind for the future, although I love it so much I don't really care. Seen here. Lilly Pulitzer Ophelia Swing Dress - originally $178.00, on sale $69.00. I snagged this during the Lilly Pulitzer After Party sale after New Year's, and I have to say, I like it, but not nearly as much as the LWD I scored last year. This one just doesn't seem quite worth the price tag, even on sale. It is cute, but I think I'm going to be more careful shopping their sale from now on. Panacea Ball Drop Earrings - $28. These are so cute in person, but a word of warning, they're actually more neon than I thought. I used to be the neon queen though, so I'm not mad about it. I can't wait until it's seasonally appropriate to wear these! Madewell Jeans - originally $128.00, on sale $48.99. When I was putting together my recap for 2016 post, I discovered my favorite jeans were back in stock in my size and on major sale, so I had to snag them. Very happy to have a pair of dark wash jeans with zero distressing / hem detailing for those days when I truly need a dressier jean. Halogen Bow Back Sweater - $79.00. I saw this sweater and I had to have it, and I did not care that it was not on sale nor that it's more expensive than I would usually spend on a sweater. It's really flattering, it's surprisingly soft, and I love, I love, I love it. Seen here. Steve Madden Clutch - $75. Something else I saw and had to have. Apparently I have a problem with self control. Anyway, it's somehow even more gorgeous in person, and I can't wait to bust it out on spring break. Clare V Petite Alice Bag - $175, used giftcard $0. I talked about this bag versus it's larger size here, and I'm happy I went small. Plus, Jeff said "a bigger size would look weird." Thanks husband! J. Crew V Back Sweater - originally $59.50, on sale $35.70. I had to snag this when it was on sale, and again, it's so good in person. The material is amazingly soft, almost like a fleece or sweatshirt, and it's really flattering. The v is a little deep, but nothing a little fashion tape can't fix.